Located at Offutt Air Force Base near Omaha, Neb., the United States Strategic Command (USSTRATCOM) is one of ten unified commands in the Department of Defense. The Space Foundation is an international nonprofit organization and the foremost advocate for all sectors of the space industry - civil, commercial, and national security. 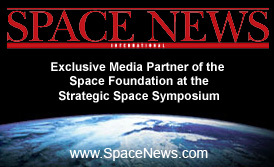 The United States Strategic Command (USSTRATCOM) and the Space Foundation created the Strategic Space Symposium for space and defense professionals.